EP4 Sonic Defenders® Plus protect your hearing without interfering with your ability to hear routine sounds or conversations. Their triple-flanged stem design fits larger ear canals and provides a Noise Reduction Rating (NRR) of 24dB. Sounds, at safe levels, are allowed to pass through into the ear canal, while potentially harmful noises (above 85dB) are reduced to safe levels via a proprietary design that incorporates a special noise-reducing filter. EP4s include attached filter caps, which can be inserted for additional protection and blocking out lower-level noise, like that heard on a plane, where hearing ambient sounds or conversations isn't critical. 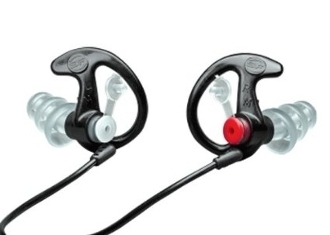 The right/left color-coded Sonic Defenders Plus are made from a soft but durable, hypoallergenic polymer and are ergonomically shaped, with an adjustable-stem design, providing a secure fit, all-day comfort, and extended product life (up to 6+ months, depending on usage and care). And their low-profile design means they can be worn while wearing a helmet or mask, or while using a phone or headset. EP4 Sonic Defenders Plus are sold as a single left/right set. Each set is packaged in a convenient carry case and includes a polymer lanyard. provides secure seal and all-day comfort.